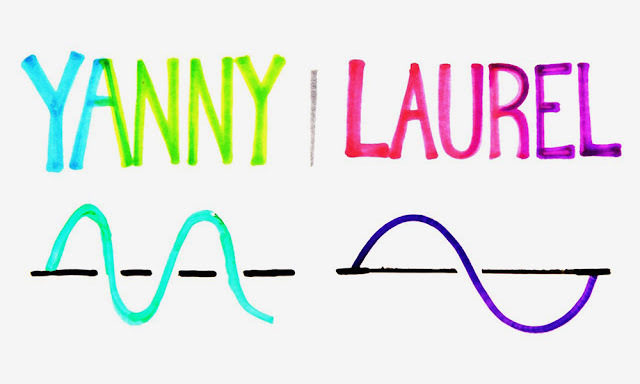 perceptionsense: The McGurk Effect: Is it Yanny or Laurel? The McGurk Effect: Is it Yanny or Laurel? Recently, the internet was swarmed with the question: Do you hear Yanny or Laurel? An audio recording with these two phrases in it recently went viral, and became an internet sensation. It divided the nation, but was later confirmed to be saying "Laurel" after analysis by audio experts. However, I wanted to look into it a little further. After reading Chapter 10 in our textbook, I read about the McGurk Effect, and how you can visually see and hear two different things with speech, as demonstrated with "fa, ga, ba" etc lip reading experiments. We experience the information that we obtain from speech perception without even realizing it, which is why we hear different things than others and it's why the McGurk Effect exists. After experiencing the recent internet sensation, I wanted to see if the McGurk Effect could be applied to the Yanny or Laurel debate. It turns out that it does. Below is a video that has the McGurk Effect with the Yanny/Laurel audio. Even though it was confirmed to be Laurel, I still hear Yanny. What do you hear? Bryner, Jeanna. “'Yanny' or 'Laurel'? Why Your Brain Hears One or the Other in This Maddening Illusion.” LiveScience, Purch, 16 May 2018, www.livescience.com/62583-yanny-laurel-auditory-illusion-explained.html. Yanny Laurel Original vs. The McGurk Effect | Does Vision Impact What You Hear? Hi Hannah! I like the way you applied the McGurk Effect to the "laurel/Yanni" debate. I was actually doing some research on the matter because I was going to write on it too. The information I read was fascinating and ties into this course so well. Based on a twitter pole, the country was almost split exactly in half - some hearing Yanni and others Laurel! It seems to be based on the pitch and sound frequency of the recording. I actually hear Yanni, so we're on the same page on that "note". I believe there is a lot more we can look into and research based on these findings and the awareness that something like this can happen. Something I was thinking about is: if it is possible to do this with other words, it can maybe serve as a good tool for the government/law enforcement and others... to use when trying to communicate confidential information :) Who knows?!?! I still hear "Yanni". I have tried listening to it on multiple devices and I always hear "Yanni". Sound perception is so interesting! I hear "Yanny" as well no matter how many times I've played it and no matter how much I try to convince myself it's saying "Laurel". I am actually very surprised that all three of you hear "Yanny" as well because I would say 90% of my friends and family hear "Laurel". Great post and great connection to the laurel/yanny debate! This video freaked me out, because the first time he said it I heard "yanny", but when he continued I heard "laurel"! It is so interesting to me how some people perceive the same thing differently. I hear Yanny and cant hear laurel no matter how many times I hear it. It is interesting how people hear Laurel. I like how you related it to the McGurk effect.